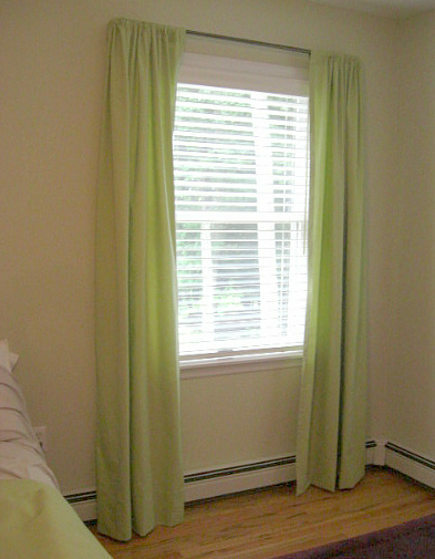 Two DIY curtain secrets that helped me improve the look of my ready made guest-room draperies. I never thought I would be doing a DIY curtain project or writing about curtain secrets I learned in design school. 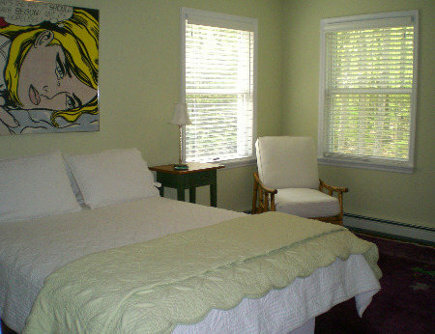 But my guest room curtains have been a back-burner project for the past three years. The pair of corner windows in the room provide good light but, like every original (translation: ugly) window in my house, they cry out for draperies. This project has been slow primarily because the room is painted in Farrow & Ball’s Green Ground, a highly mutable (and difficult to photograph) celery color that changes from gray to acid green throughout the day and isn’t an easy match. Luckily though Pottery Barn provided me with the perfect lettuce green quilt. Living in New York City gives me access to the wholesale market so it was never hopeless. I did find two gorgeous Kravet fabrics — one from Barbara Barry’s collection [right] which was dead-on the wall color and a second embroidered Indian linen [on the left] with a supple hand and ivory floral design. Both were tagged with the name “peridot,” a gem color which certainly sounds fancier than celery given the $100 a yard price tags. Since I needed 4 panels, and each requires a minimum of four yards, it’s not hard to do the math and figure out why I didn’t use either of those fabrics. Plus, I still need curtains in the library. So I began looking at ready-made panels whenever I was in a store, watching for sales, ordering color swatches and not finding much. Then in May, during a 2-minute dash into Pottery Barn, two possibilities magically appeared; both on sale. One was a ribbed cotton and a good match. It didn’t come with rings so I settled for rod-pocket-style panels at $19.95 each. 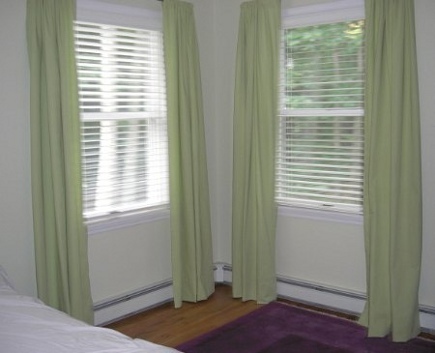 The windows have light-blocking Venetian blinds [top photo] so the combination of good color, nice fabric and price persuaded me that stationary panels would work just fine. Ready-made panels come in standard lengths so my choices were 84- or 96-inches. While I wasn’t thrilled at the prospect of a 4-panel hemming project, I knew the 84s would be too short. My parents owned a drapery and upholstery workroom so when it comes to curtains, I am picky, picky, picky. Few things look worse to me than skimpy draperies. I ordered 96-inch long panels which arrived folded in plastic pouches like pillow cases. I could see the folds would be murder to steam out (it’s a poly blend) and they looked a lot like…shower curtains. But once I had them in the room and held them up to the windows, I felt they would work. I just had to do a little magic with the hemming. First, I needed to get drapery rods installed so the panels could be hung for measurement. So I turned to a favorite source, Highland Forge, which makes high quality custom drapery rods at affordable (though certainly not bargain) prices. 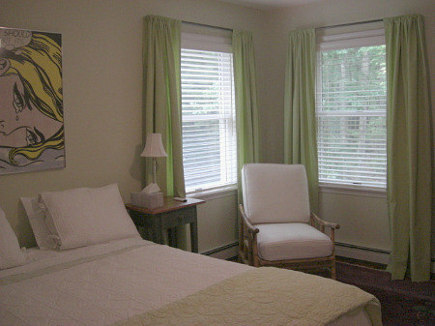 I quickly settled on simple, ¾-inch return rods, which match the style in my bedroom. These resemble hollow C-shape drawer handles that slip onto brackets and are held in place with set-screws. 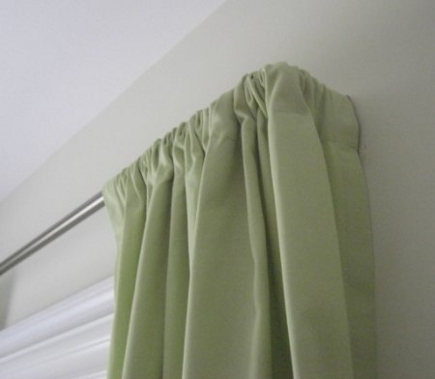 I prefer return rods because they allow curtains to be pulled directly against the wall – eliminating any “light gap” on the sides and covering the brackets. Here’s a peek at the top of the curtains. To order the right widths, I added 3 inches to each side of the window frame. So my 48-inch wide frames took 54-inch long rods. 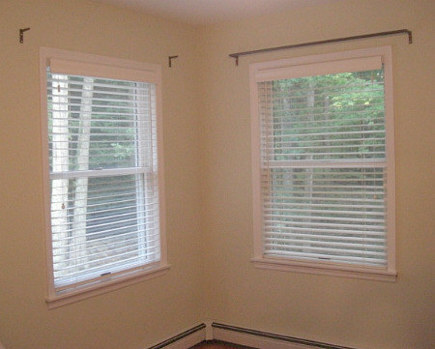 For my windows, curtain rods look best 3-inches above the top of the frame, which means the overall length for the curtains to graze the floor would be somewhere between 86 to 88-inches. The 96-inch-long panels assured me 9-inches of leeway. So to get rid of the 2-inch factory hems, I measured 3-3/4-inches from the bottom, ironed in the crease, and sewed 1/8-inch in along the folded edge. Then I cut away the factory hems. That left a neat edge, ready for hand-hemming. I then basted a 4-inch hem into one panel — at 88-1/4 — and hung it on the rod to test the length. It was two inches too long and the fabric was too stiff to puddle. I calculated the correct length at 86-1/4 inches. That gave me with 6-inch deep hems. Perfect! 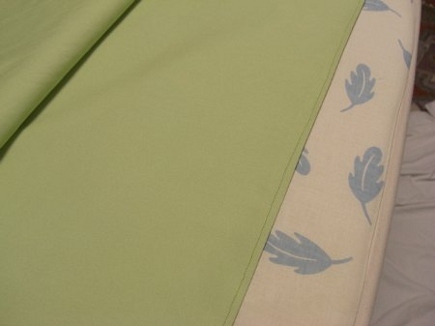 Now I will pass along two curtain-hem secrets given to me by my design-school drapery class professor, the wonderful Jamie Gibbs, who we’ve been honored to have as a guest blogger here at Atticmag. 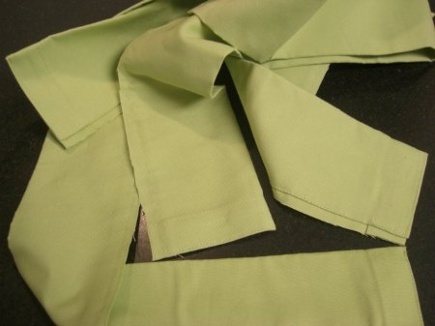 Secret #1: Unless fabric is very thin (sheers for example), deepening the hem to 5- or 6-inches acts like a weight at the bottom giving panels some flair and the illusion of fullness – a more custom look. Secret #2: Never, never iron the crease on the hem. Leaving it un-ironed helps create the flair. 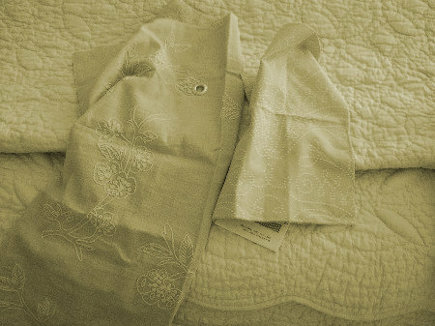 And – perhaps more important – the absence of an ironed-in crease makes it possible to lengthen draperies if necessary. Knowing in advance that I’d do deep hems is why I ordered panels that were long enough to allow me to cut off the factory bottoms and also why – once that was done — I didn’t need to spend time cutting them down any further. Luckily I didn’t. Because I was in a hurry to get the draperies up, I didn’t baste and test-hang all four panels. I just hemmed. When they all went up, three panels were perfect and one appeared shorter where the floor is uneven. 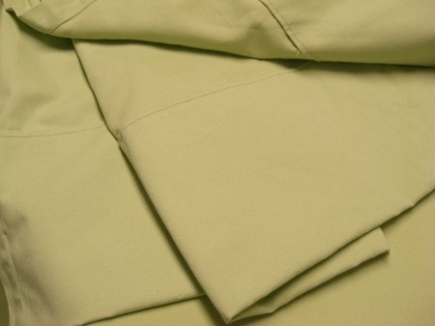 Since the hem was ample and was left unpressed, there was no telltale line or crease after it was adjusted. While the short panel (closest to the bed) is behind the furniture and could be left, I took it down and adjusted it easily (and I didn’t procrastinate!). Luckily, I knew the curtain secrets.